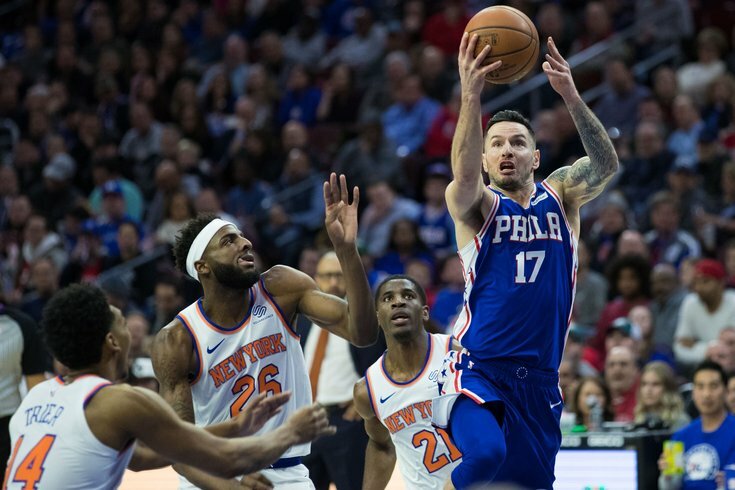 Philadelphia 76ers guard JJ Redick (17) drives for a lay up past New York Knicks center Mitchell Robinson (26) and guard Damyean Dotson (21) during the fourth quarter at Wells Fargo Center. On a Wednesday night at home against the Knicks, the Sixers finally got something they've needed for a while: a comfortable blowout of an opponent who isn't quite at their level. The 117-91 victory over New York allowed the Sixers to turn the game over to the bench in the fourth quarter, with the team's relentless ability to surrender big leads disappearing for at least one night. That was as much about how bad the Knicks are as it is about the Sixers' performance, but you can only play who is on the schedule. And it hasn't really mattered who the Sixers have been up against this year, anyway, they've managed to make things interesting against much lesser opponents in recent weeks. We don't need to go super in-depth to reveal that Philadelphia was the better team Wednesday. Still, even blowout losses offer more information to weaponize as the season rolls along. Against opponents large and small, fast and slow, the Sixers need to develop counters to their pet plays and different looks they can succeed out of. That's basically the point of this opening stretch of the season — you try new things, and you see what's worth keeping around for the stretch run. In the meantime, the Sixers can also feel quite safe leaning into the stuff that already works. So much of Philadelphia's offense over the last year plus has come through two-man sets involving JJ Redick and Joel Embiid. It's not all that difficult to see why they love the look so much. Redick's shooting gravity drags teams all over the place, and against a miserable opponent like the Knicks, those dribble handoffs are all you really need to get things going. Redick was absolutely ridiculous on Wednesday night, pouring in 24 points on just 14 shots. With New York seemingly unable to figure out Philadelphia's most common action, even the fans in the stands were able to diagnose where the ball should go. At one point, a man near the media section just kept yelling, "Keep going to Redick!" every time they got the ball. To the man's credit, Redick would not have turned down the opportunity, and he reflected on what it feels like to be on a heater after the game. "I always feel like when I shoot the ball it's going to go in," said Redick, "but there's a different feeling I think when you haven't missed and you've taken a few shots and you just keep seeing the ball go in. It certainly increases the dopamine levels in your brain." When Redick gets cooking like he was Wednesday, the sea parts for guys like Joel Embiid and Ben Simmons, who end up the recipients of mid-air passes from Redick and turn them into dunks. You can feel the crowd rise when they see it coming for Embiid, who (usually) rewards them by hammering it home. Early on, it didn't even seem like Embiid was out of his first or second gear, and then you look up at the scoreboard and see that he's stuffing the stat sheet and flirting with a triple-double. In 30 minutes, he came up with 26 points, 14 rebounds, and seven assists with just a single turnover. He is every bit of an MVP candidate, and the more the Sixers play like this, the realer his candidacy becomes. The wrinkles and additions to the playbook will come. For now, sometimes you can simply lean on your best players and your most productive sets. Talented as their top-end guys may be, Philadelphia has desparately needed to get easier looks for them for years, dating back to Embiid's rookie season. Through a combination of factors, the Sixers are finally doing it with regularity. Credit Simmons' passing out of the post as part of the progress. With Jimmy Butler in the fold, Simmons has made it a point to establish position and attack teams from the post in a multitude of ways. Brett Brown continues to refer to him as a point guard, but that doesn't mean his passing needs to be utilized from positions occupied by traditional definitions of the position. Combine that with Redick's atttention-drawing, and you have a recipe for success. When you use him as a screener for Embiid, opponents have to choose between stopping an Embiid cut to the rim or an open three for Redick. Not exactly the scenario you want to find yourself in. Now if only the Sixers were as productive cutting off the ball when Embiid has the ball on the low block, he'd have a lot more games with big assist numbers and low turnovers. Butler has already begun helping them in this regard, both with his own movement off the ball and the attention he draws on the perimeter, opening lanes for other guys to cut into. Things are humming for Philadelphia right now. Healthy disclaimer here: the Sixers do not get to play the Knicks every night. But in theory, their blowout win over the Knicks is an example of why teams strive to get as much high-end talent as possible before figuring the rest out later. Butler has been immense in late-game situations for the Sixers, and has been every bit as good as you could have expected him to be this soon. As he learns the playbook and builds chemistry with his teammates, the world will open up more for everyone. For now, there will be some nights when he's simply not needed to be the focal point. And that's more than okay — the Sixers have an MVP candidate at the pivot and a 6-foot-10 wunderkind they're trying to develop as a point guard. Philadelphia's culture is based around shared responsibility, and so far Butler has looked at home in that environment whether he's taking five shots or 25. He was closer to the former on Wednesday, taking a backseat as the Sixers rode Redick's hot hand and Embiid for most of the night. And there are still things to toy with down the line as Butler settles in. His minutes have predominantly come alongside Simmons so far, with Brown doing little staggering of his two best perimeter players. When I asked the coach about it before the game, he noted it was an idea he wants to explore as Butler is integrated. "There are times you saw in the [Brooklyn game], I put Ben out with not Jimmy, Joel, or JJ, and let him just run riot," said Brown. "In a funny way, I think Jimmy's going to be able to benefit playing with a more traditional point guard like T.J. [McConnell]. Let [Butler] feature in the offense, because T.J. is just going to run it, and Ben's not going to run rogue or do things Ben can do." Brown mentioned there will be roadblocks here regardless, as the will of the players matters too. The staff consults with their stars and figures out a plan incorporating how they like to be subbed, and the stretches of time they're most comfortable playing. Combine it with gut feel and analytics, and it's a complicated stew. As they work through it, the margin for error is simply larger now with another star in place. Stopping all of Philadelphia's top options is pretty unlikely. This isn't a subject worth dwelling on because we discuss so often here, but running out Mike Muscala at backup center is the far superior option for Philadelphia with this roster. Brown appears to be giving this look a real opportunity lately, with Muscala serving as the first big off the bench over the last couple games. The sample size is limited, but even when he doesn't make shots, getting a theoeretical shooter on the floor helps to keep things humming when Embiid rests. The more space the Sixers can create around Simmons, the better. The sample size is extremely limited, but in limited time together, the most common bench groups with Muscala at five are massive positives for Philadelphia. Simmons-Shamet-Butler-Chandler-Muscala has a +20 net rating, while Simmons-Redick-Butler-Chandler-Muscala is at +23.5, per Cleaning The Glass. Those numbers will normalize over time, but the proof of concept is there. Amir Johnson will have his moments of usefulness this year, and I don't think we're going to see an extended stretch without him. Brown tends not to bury veterans completely, and using him to sop up some minutes will help in the long-run. But the obvious configuration has not changed. More of this, please. The schedule has been condensed for the Sixers to start the year, but their strength of schedule hasn't exactly been mind-blowing. Games against teams like Phoenix, Cleveland, and New York were viewed as potential blowout opportunities, which would theoretically offer some valuable minutes on the bench for their heavy minutes guys. With the game becoming pretty uninteresting late on Wednesday, I was less interested in hearing what the Sixers thought about kicking the crap out of the Knicks and more interested in how starters end up spending their time on the bench late in games. I think some of it is just you're joking around, maybe talking politely to the other team, goofing around with them. Ron Baker almost hit the shot clock on a layup attempt, we said a few things to him. In a playful way, not trying to degregate him or anything like that. And then honestly, I use that time...because generally you don't have a lot of time to sort of decompress with guys. Everybody kind of, you go do your shower, I do my treatment before I shower. So I kind of use that [blowout] time to sort of check in about certain plays, maybe that happened during the game, with either Ben or Jo or Jimmy, or maybe another guy, but usually one of those three guys. You just kind of rehash something, and then you move on. In other words, blowouts are good for the mind, body, and soul. The Sixers could use a few more of these bad boys.